Each day we all experience sound in the environment. Many of these sounds are low intensity, satisfying, and others are the mundane sounds of life, such as television, radio, household appliances, cars running, traffic, etc. Most of these sounds are at very safe levels and do not cause any danger to hearing. We also know however, that there are loud sounds, some brief, other long lasting, that can injure hearing causing Noise Induced Hearing Loss (NIHL). We know that NIHL can be immediate or be incurred over a long period. It can be temporary, or permanent affecting only one or both ears. We also know that this type of hearing loss, though one of the most prevalent, can be prevented by less exposure to loud noise, music or other sounds. According to the NICD (2016), about 15% of the US population between the ages of 20 and 69 or 26 million people have hearing loss that was probably caused by noise exposure at work or in those noisy, but fun leisure activities. Until recently, the thought was that most NIHL was caused by significant damage or death of the hair cells within the cochlea. Rabinowitz (2000) summarized the typical thoughts on the pathophysiology of NIHL. He felt that, “Sounds must exert a shearing force on the stereo cilia of the hair cells lining the basilar membrane of the cochlea. When excessive, this force can lead to cellular metabolic overload, cell damage and cell death. Noise-induced hearing loss therefore represents excessive “wear and tear” on the delicate inner ear structures. Once exposure to damaging noise levels is discontinued, further significant progression of hearing loss stops. 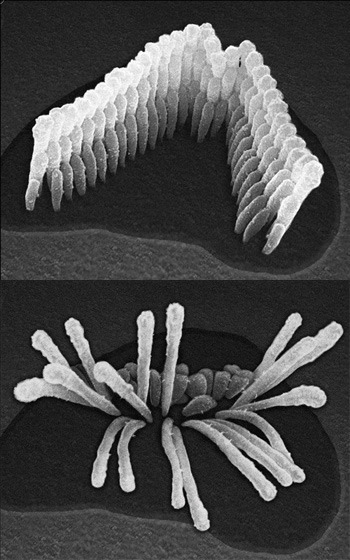 Individual susceptibility to noise-induced hearing loss varies greatly, but the reason that some persons are more resistant to it while others are more susceptible is not well understood.” For decades’ studies from around the world have concurred with this suggestion that NIHL and age related hearing loss have focused upon the loss of these stereo cilia, often called hair cells. 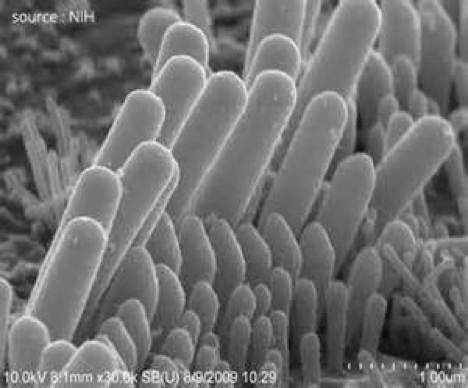 While these stereo cilia are vulnerable, researchers at the Massachusetts Eye and Ear Infirmary’s (MEEI) Eaton Peabody Laboratory at Harvard Medical School have now shown that nerve fibers are even more vulnerable to damage from noise. In the normal ear, sound waves are transmitted through the middle ear bones to the inner ear, where they cause vibrations in the sensory epithelium called the “organ of Corti.” The organ of Corti turns this mechanical function into electrical pulse trains in the fibers of the cochlear nerve, which then carries the information to the brain for analysis of the acoustic scene. Dr. Charles Liberman, Director of MEEIs Eaton Peabody Laboratory, is an expert on the peripheral auditory system. He explains that, “The organ of Corti contains two types of sensory cells: outer and inner hair cells,” explained Charles Liberman, director of MEEI’s Eaton Peabody Laboratory. In their research, Liberman and Sharon Kujawa, Director of Audiology for MEEI stained synapses with antibodies that target molecular structures within the synapse, which allowed the synapses to be seen and easily counted in a light microscope. This enabled them to view many synapses on hair cells in a normal ear, as well as the greatly reduced numbers of synapses hair cells following a noise exposure that caused only a transient elevation of thresholds. 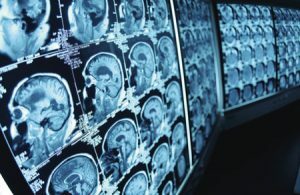 They noted that “each missing synapse represents a missing cochlear nerve that has been disconnected due to retraction of the terminal segment — it will never reconnect.” Liberman also indicated that, “It no longer responds to sound and, within a few months is almost certainly unwarranted,” The researchers are aware of the public health implications of their findings in that all our federal noise exposure guidelines assume that noise exposures cause only transient threshold elevation are benign and now that assumption is certainly outdated. While their research was conducted on mammalian ears, mouse, guinea pig and chinchillas, there is every reason to believe that that this same phenomenon exists in humans. The study has led to the possibility that maybe these synapse issues can be reversible, continuing research goes on in their laboratory on this issue. Those of us that see patients each day can testify to this interesting study as we often see patients that have minimal hearing loss on the audiogram, but significant difficulty hearing, or with tinnitus. It is just this type of research that begins to confirm some of the clinical mysteries of hearing, hearing loss and hearing rehabilitation, seen in the clinic each day, and unexplained for decades.